Community Organizing + Storytelling + Movie Making. We are putting the Fairmounts in front of and behind the camera to celebrate neighbors. Collaboration with artist Ryan Mulligan, Cradle Cincinnati Connections, Cincinnati creatives, and neighbors in North & South Fairmount & South Cumminsville, working together to create 14 short films about the community by the community. Opening reception for Curious to See will be held April 8, 2016 at 6pm in Beeler Gallery, Columbus, OH. The show, open and free to the public, will be up until April 28. Curious to See is an MFA Thesis Show, featuring the culminating achievements of the Columbus College of Art and Design's 2016 class of MFA candidates. This year's show will be the first MFA thesis show featured in the newly remodeled Beeler Gallery. Community Organizing + Storytelling + Movie Making. 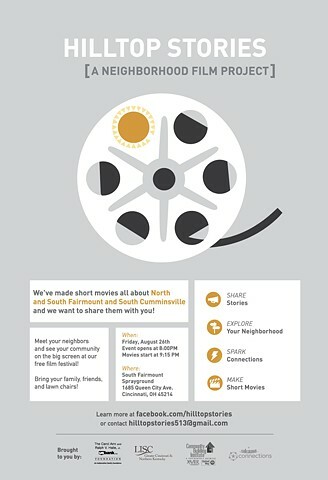 We are putting Walnut Hills in front of and behind the camera to celebrate neighbors. Collaboration with artist Ryan Mulligan, The Gallery Project, Cincinnati creatives, and neighbors in Walnut Hills, working together to create 7 short films about the community by the community. Outside the classroom these educators are professional artists and designers, collectively displaying a variety of media including woodworking, photography, oil painting, mixed media, sculpture, fiber art, ceramics among many others. The exhibition and reception are free and open to the public. The Art Academy of Cincinnati is located at 1212 Jackson Street in historic OvertheRhine. Gallery Hours: Friday, May 24: 9-9, Saturday, May 25, 9-4, Tuesday, May 28 – Friday, June 7: 9-9. My studio will be open as well as most of the others throughout the building. This is a great opportunity to do a little shopping and/or viewing of art works made by local artists. Tim Atherton, Leah Beeferman, Jerry Birchfield, Mark Brabant, Brittany Campbell, Cetusss, Skott Chandler, Cleveland SGS, Le Contremaître et sa contremaîtresse, Randolph Crider, Peter Damm, Dana Depew, Greta Gratos, Matthew Hostelley, Harris Johnson, Sam Meador, Joseph Minek, Michelle Marie Murphy, Lee Norris, Lauren Yeager. *It is a non-traditional gallery space provided by: Pop Up City / Cleveland Urban Design Collaborative, and 1025 Huron Road, LLC Conor M. Coakley, Colliers Ostendorf-Morris.